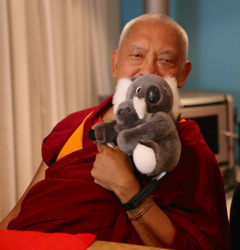 Lama Zopa Rinpoche with koalas, Blue Mountains, NSW, Australia, June 2015. The New Mandala Is Published! Students “Worked a Day for Rinpoche” in 50 Countries! FPMT’s Thirteenth International Sangha Day! 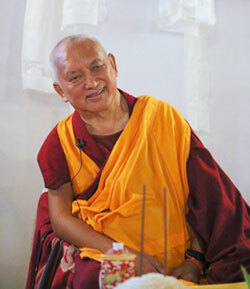 Lama Zopa Rinpoche, India, February 2015. A student wrote that she had cancer and the doctor advised getting chemotherapy. The student requested advice from Rinpoche on what she should do. 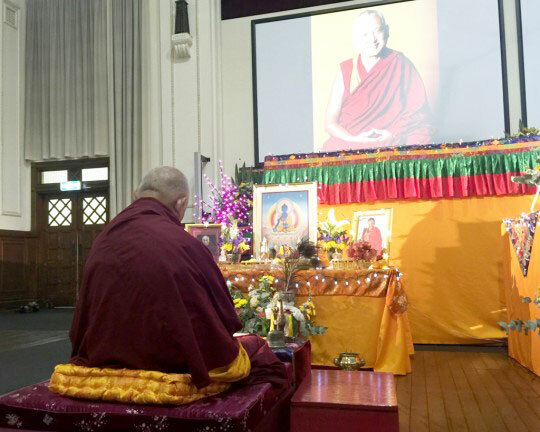 Lama Zopa Rinpoche at Buddha House, Australia, May 2015. Lama Zopa Rinpoche doing preparation, Buddha House, Australia, May 2015. Keep up to date with Lama Zopa Rinpoche News. Find a wide range of advice from Lama Zopa Rinpoche on Rinpoche’s Advice page. Go to the Lama Yeshe Wisdom Archive for lots more advice from Lama Zopa Rinpoche. 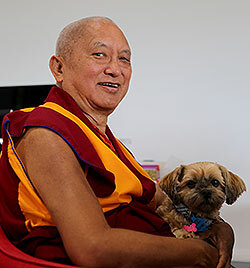 Lama Zopa Rinpoche with new friend, Adelaide, Australia, June 2015. Please contact the hosts directly with any questions. Subscribe to our FPMT news blog to get updates as soon as they are announced. Lama Zopa Rinpoche with Ven. Kunsang, Ven. Lindy Mailhot, Ven. Sangpo, Helen Patrin, Ven. Sherab and Carey Aburn in Australia, June 2015. “Just by reciting this mantra one receives success, and one does not get harmed by weapons, fire, water, poisons, substances mixed with poisons, black magic, one cannot be harmed by kings, thieves, robbers, and so forth. Wherever this mantra is written and left, people do not receive sicknesses, harm and contagious diseases and will achieve the concentration called stainless light.” – Lama Zopa Rinpoche. This beautiful Vairochana mantra card is printed on pearlescent cardstock. Also available as a PDF download. We’ve re-imagined Mandala magazine and we’re proud to unveil the new issue, published on June 16. The new Mandala magazine features timeless teachings, interviews and stories to support the development and deepening of our Dharma practice. 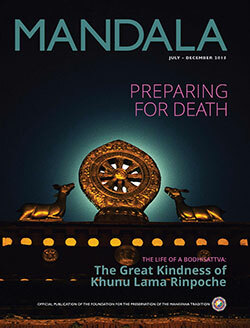 Mandala July-December 2015 looks at the importance of death awareness practice and of knowing how to enjoy death as shared in teachings by Lama Yeshe and Lama Zopa Rinpoche. Also in this issue, the biography of the great Buddhist master Khunu Lama Rinpoche; Ven. Robina Courtin writes about the creation of Lama Zopa Rinpoche’s book How to Enjoy Death, forthcoming from Wisdom Publications; an interview with Tibetan Buddhist scholar Elijah Ary; we remember Dharma pioneer Ven. Ann McNeil; and much more. You can order this issue from the FPMT Foundation Store. 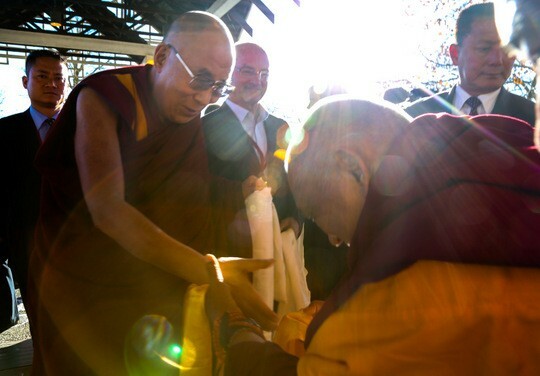 Or to receive Mandala on an ongoing basis, become a supporter of the Friends of FPMT program. Our very popular annual fundraising campaign Work a Day for Rinpoche attracts students from all over the world who wish to dedicate a day of their work earnings to support a host of FPMT Dharma activities for the auspicious occasion of Saka Dawa. This year 450 students from 50 different countries offered more than US$43,000! Their offerings will work towards fulfilling Lama Zopa Rinpoche’s vision and mission; helping provide more FPMT educational resources; assisting our worldwide charitable projects, and supporting FPMT centers, projects and services, and more. Thank you all so much! Sign up to receive daily posts of all FPMT news blogs via email. 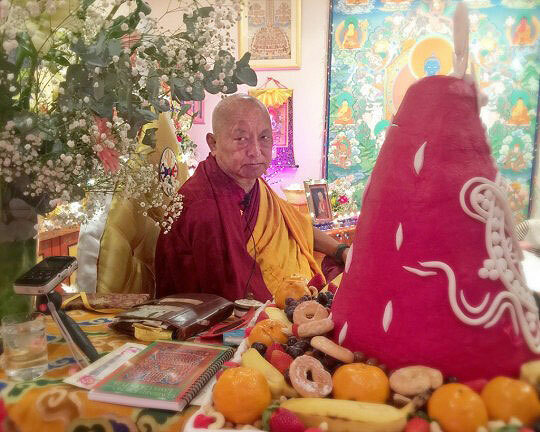 Let’s celebrate FPMT Sangha on Choe Khor Due Chen: July 20, 2015. At CPMT 2014, we discussed the future of Sangha in the FPMT and agreed how crucial it is to support the International Mahayana Institute (IMI), because if we want to preserve the Dharma, we need the Sangha, and if we want to preserve the Sangha, we need monastic communities and monastic training. International Sangha Day is also a perfect day for centers, projects and services to make their annual donation to the Lama Yeshe Sangha Fund (LYSF). The four Spanish Basic Program (BP) translations published by Ediciones Mahayana are now available as bookmarked PDFs from the BP Materials web page. Our gratitude goes to Ven. Nerea Basurto for her untiring efforts resulting in the successful establishment of the Spanish Translation Services and the completion of so many publications. She is now focusing on translating the Masters Program texts into Spanish. Pema Dhondup, a Tibetan filmmaker based in Los Angeles, is releasing a short documentary titled The Letter on July 6, 2015. It is a prelude to the motion picture and video series project titled Search that covers the entire history of the Dalai Lama institution beginning from 1391 when Pema Dorje was born to a nomad family and later became the first Dalai Lama, Gedun Drubpa. There’s more on the project on the website www.searchdalailama.com. If you wish to watch or screen the film to family and friends on July 6, 2015, please contact Pema Dhondup. Lama Zopa Rinpoche with His Holiness the Dalai Lama, Blue Mountains, NSW, Australia, June 2015. The Wesak Festival of Light celebrated the birth of Buddha and also the next stage of building the Great Stupa and the monastery surrounding it in Bendigo, Australia. L’équipe du Service de traduction francophone de la FPMT est heureuse de vous annoncer la publication d’un nouveau livret: Servir autrui, un chemin vers l’éveil. Ce livret contient de précieux conseils de Lama Zopa Rinpoché sur comment pratiquer le Dharma et travailler dans un centre. Gendun Drubpa Centre, Canada, is hoping for an FPMT registered teacher to become their new resident teacher. Kushi Ling, Italy is looking for a center director. Mahamudra Centre, New Zealand, is looking for a full-time center manager, volunteer vegetarian cook and groundskeeper. Land of Joy, UK has various volunteer positions open. 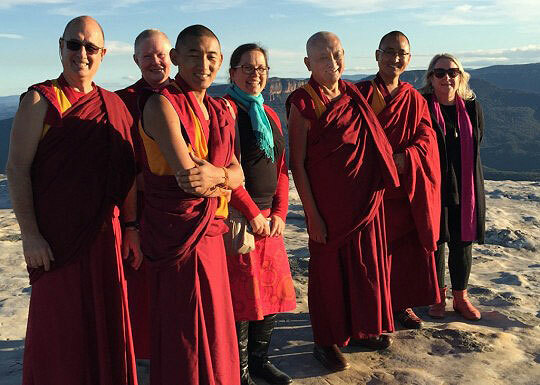 Closed FPMT study group: Wishfulfilling Thought Transformation, Australia – we rejoice in their efforts to serve sentient beings.